Radar Hoverlander and his girlfriend, Allie Quinn, scored big on their last con, so they vow to get off the razzle. But before Radar can even figure out what he wants to do with his life, he rescues a lost mutt. Within minutes of becoming a dog owner he finds himself saving a woman and a little girl by snooking a drugged-out bad guy with a grifter’s roll and some bafflegab. (Just read the book.) Of course it’s all caught on camera and shows up on YouTube. So much for the straight and narrow. With Santa Fe, New Mexico, as the colorful backdrop with its woo-woo artistic vibes spinning in the wind, it’s no wonder that Radar can barely stay out of trouble for five minutes. Add snooty art world aficionados into the mix, a dash of casino double-crosses, and a cast of colorful characters and John Vorhaus ends up with a clever plot full of so many twists and turns that the reader might need to take Dramamine. When Radar spots an ugly and lumbering lady in red shadowing him through the streets of Santa Fe, he’s surprised—and alarmed—to find out the lady is his father. Woody Hoverlander, a world class con artist and deadbeat dad (dressed in drag), is in trouble, and it’s up to Radar and crew to help out Pops before the Vegas hard guys come gunning for a $5 million debt. Radar’s best pal, the bumbling but loveable Vic Mirplo, has started creating art as a con—while making buckets of money. 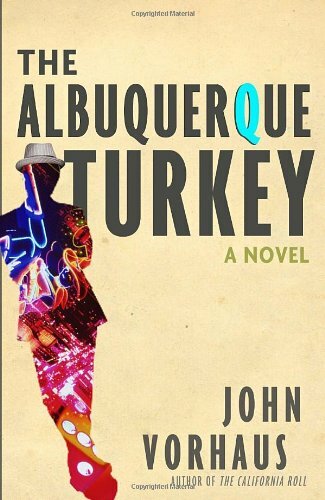 When Radar needs someone to flash some cash in Vegas he reinvents Mirplo as the ultimate high roller—the Albuquerque Turkey—and dangles him as bait to help his dad get off the hook. The author also wrote the nonfiction book, Killer Poker, and once made the final table at the World Series of Poker, so when he takes the reader inside the underbelly of Vegas, it’s no scam. In this fast-paced story, Mr. Vorhaus channels Elmore Leonard and Carl Hiaasen with his glib dialogue complete with grifter slang and witty writing, filling the pages with laughs, true love, friendship, and cons at every angle. In the end the reader will finally be let in on the grift—making the Albuquerque Turkey a rare bird indeed. Candice Reed is co-author of Thank You For Firing Me! How to Catch the Next Wave of Success After You Lose Your Job (http://www.thankyouforfiringme.org, Sterling Publishers, 2010). Currently, she is a freelance journalist, copywriter, and speechwriter. Ms. Reed was also a ghostwriter for a former president. She has published more than 5,000 features, essays, articles, and book reviews.